Breeze through the final stages of pregnancy with the Mama Mio Third Trimester Oil Bundle. Combining a trio of bestselling Mama Mio products, the bundle is designed to treat and care for mum-to-be during the third and final trimester of pregnancy, when fatigue levels are high and skin can be stressed. Host to a moisturising body oil, soothing breast cream and cooling leg gel, each product within the bundle is suitable for use whilst pregnant and will leave skin thoroughly nourished. Free from parabens, petrolatum, colourants, xenoestrogens, PEGs and phthalates. 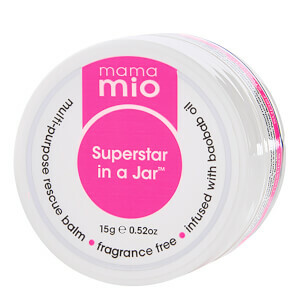 If skincare safety is your concern, you are in safe hands with Mama Mio. Help revive tired legs with Lucky Legs Cooling Leg Gel. The lightweight yet powerful gel leaves legs and feet feeling comfortable and soothed. Formulated with essential nourishing oils, menthols and spearmint to relax and refresh skin. The additional pressure and water retention when carrying a baby can start to weigh you down, so its compact size fits perfectly in your handbag for whenever you require a boost.